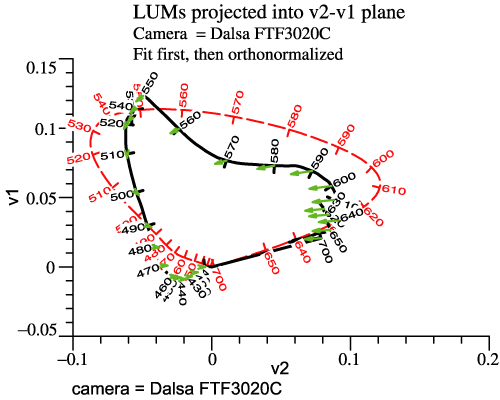 Dalsa FTF3020C, Locus of Unit Monochromats in VRML by FF, etc. Usage note: To see some preset views, click 'view' arrows below the 3D picture. In the virtual reality picture above, the Locus of Unit Monochromats for the human 2° observer is drawn in the usual way, as the edge of the multicolored surface. The LUM of the camera is indicated by spheres. The short arrows indicate the transition from the camera's LUM itself to the best fit, so the arrow tips are the best fit curve. If the spheres lay right along the human LUM, that would mean that the camera fulfills Maxwell-Ives. In that case, the camera's LUM would be the best fit, and the arrows would have zero length. Find a best fit to human LUM by a linear combination of the camera's sensor functions. 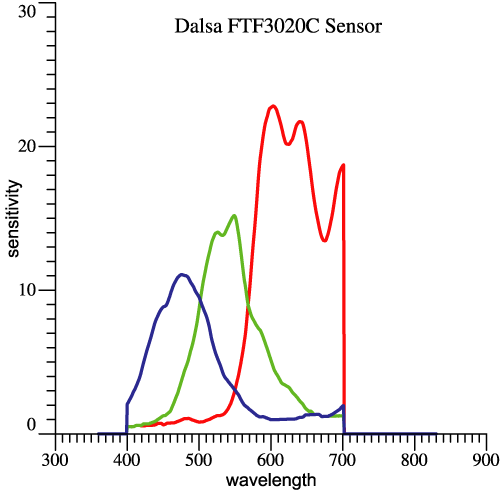 The best fit functions will look more or less like achromatic, red-green, blue-yellow, but will not be an orthnormal set. Preserving that sequence, orthonormalize the functions by the Gram-Schmidt method . 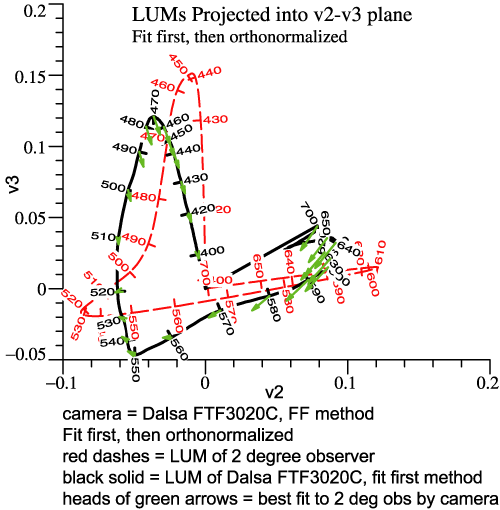 Combining those 3 functions into a 3-dimensional graph gives the camera LUM, indicated by spheres. Yes, the best fit found as an intermediate step is the same best fit indicated by the tips of the short arrows. The tiny apostrophe, ', denotes matrix transpose. The transform Y can be found for any camera, and indeed for the eye itself. 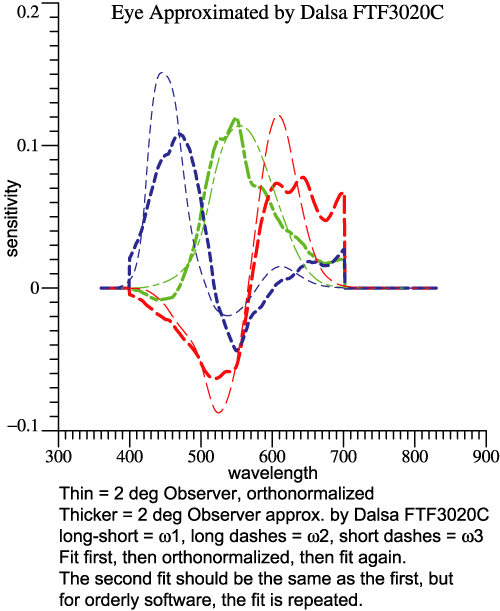 In the graphs below, the thicker functions on the left are the basis for the camera's LUM, shown above by spheres. 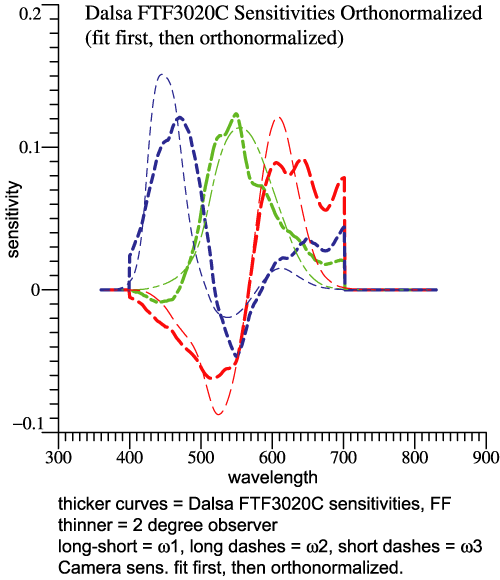 The thicker functions on the right are the basis for the best fit curve, shown above as the tips of arrows.